When is it OK to Cut Down a Healthy Tree? OK, up front, I’m going to say this is not always a popular decision among tree lovers (like myself) but yep, sometimes even perfectly healthy, viable and stable trees need to be cut down. The reasons are varied and many; sometimes out of necessity and other times out of preference but come down, they do – so best be informed beforehand. Which leads me to this: please, please before you make that decision to cut down a healthy tree, call a tree care professional. They’ll give you the straight scoop. They’ll advise if it’s truly necessary to take down the entire tree for your project or if a limb removal is a better option. They’ll advise you on the physical impact of other trees in the area or simply help you make a decision that you otherwise may later regret. A good tree care professional absolutely understand that yes, sometimes even good trees have to go. You’re building new, adding on, building a patio, placing an electronic underground dog fence, utility or water lines, sprinkler systems or putting in a deck or pool. 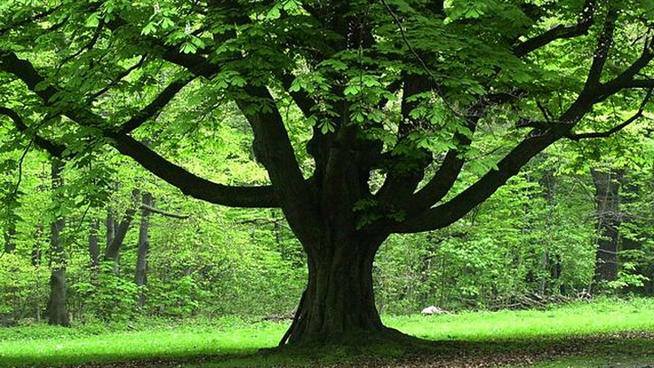 All things that may or may not affect an existing tree depending on the proximity. Your contractor may be the kind of person who says “off with its head!”, if they even think it will inhibit their ability to get the job done. Or conversely, you may be told the tree is good to stay, only to learn later the utility contractors cut the primary roots in an effort to lay their lines. You won’t even know it happened until one, two or three years later when that beautiful tree you took the extra effort to keep is beyond saving. Cutting down an existing tree will change the exposure of those left standing. Where there was once shade and shield, there may now be sun and wind -all elements that can severely impact a trees ability to survive. Yes, trees do get sunburned! That is why you don’t let your obstetrician advise you on open heart surgery or your contractor advise you on trees. You speak with the professionals who do the job for a living. A good tree care professional will have no problem letting you know what is outside of their scope. They actually want to point to you the landscape architects or horticulturist who can more appropriately advise you on the type of trees you may want to place in the area that was just left devoid of shade. Perhaps the type of tree is unappealing (OK, it’s just flat out ugly. There, I said it). Or, maybe it’s old and failing and has been pruned so many times by the wrong people that it will never be the vision of youth it once was (that’s OK, neither am I). Perhaps you don’t like its proportion in proximity to buildings or other trees– and you know what… maybe it doesn’t belong there. Could be the placement is, in fact, crowding the roots which will eventually cause the tree or other surrounding trees to die. It could happen. Maybe you love the tree but your neighborhood association doesn’t. Or, perhaps your next door neighbor is really spooked by your weeping willow branches clawing like the hand of the Hunchback of Notre’ Dame at her window in the middle of the night (this actually happened with my next door neighbor when I was a child. The poor woman deserves some sleep for cripes sake doesn’t she?) Do a web search on “Trees and Neighbors” and you’ll find It’s a common complaint. In general, your tree is your responsibility and if others property or person are harmed by your negligence to properly care for your tree, it’s on you. That said, your neighbor has the right to hack off any portion of your tree that overhangs and is harming their property. So use the Golden Rule; before you make that first cut on the limb over your yard, call the owner and talk. Make nice and the universe will be good to you. Do a search on the internet and you’ll find headlines such as “Black Walnut: The Killer Tree”, or “Growing the Poisonous Castor Bean”. They may sound a little melodramatic but the facts are that jungone, the poison emitted from one black walnut tree can wipe out an entire garden if you haven’t done your homework to find plants that are jungone resistant. My neighbor has several and I’m constantly searching for plants that can survive its ravages. And the castor bean plant? According to Cornell University’s College of Agriculture and Life Science, “It is said that just one bean can kill a child”. The good news is that “If death does not occur in 3-5 days, the victim usually recovers.” Does that headline sound too melodramatic now? Sometimes the lines are clear and easy to conclude but sometimes doing the “right” thing is just not so cut and dried. Does the end justify the means or vice-versa? It’s not worth divorce court or a neighborhood war. Compromise is your best bet so keep the tree when possible, remove or trim as appropriate and let peace reign. If that doesn’t work, you may just have to bite the bullet and let the criticism fly where it may.